Can you remember the world before blogs? I’m tempted to say I’ve been blogging for all of my adult life, but if you’ve seen the gray in my hair, you recognize that statement as, at best, exaggeration. And yet the nature blog feels like something we’ve always had and enjoyed. Just like Facebook. And eBird. And cellphones that take decent landscape shots. Clearly, we can become accustomed to good things quickly. Yet, when I started 10,000 Birds 11 years ago, the vast firmament of nature blogs was shockingly dark and, for a new nature writer, somewhat lonely. The former condition obviously improved rapidly over time as luminous new blogs populated our starry skies. Surprisingly, though, that initial feeling of writing in the wilderness faded quite quickly. Other bloggers were writing about birds and nature back in 2003, some even before then, and many of us found a communal spirit sparked by comments and crosslinks that carried into the world we wrote about. Remember the blog carnival craze? We nature bloggers were part of the scene, first as part of the seminal science carnival Tangled Bank and later with our own community carnivals like, of course, I and the Bird. Some people might still argue whether such a thing as a “birding community” exists, but anyone who shared avian observations on the internet in the late 2000’s and beyond could have been part of a vibrant bird blogging community. 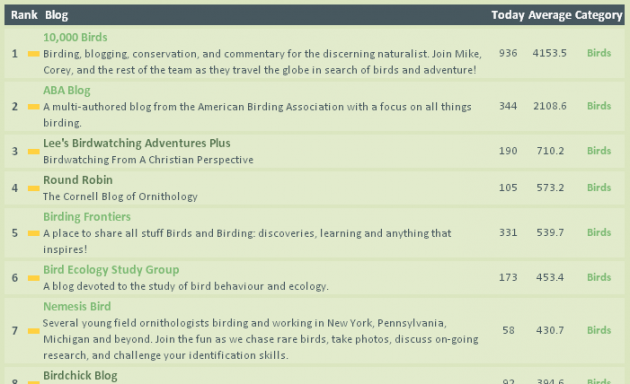 Presenting the Nature Blog Network, the toplist for the nature blog community. A site like this has the potential to be a phenomenal resource for readers and publishers alike in identifying the very best nature blogs on the net. If you write about birds, bugs, plants, herps, hiking, mollusks, mushrooms, ecosystems, or any other natural topic, adding your blog to this toplist is the perfect way to reach new readers interested in exactly what you have to offer. As a bonus, you’ll get to see where your site falls amongst those of your respected peers. And, in true blogging fashion, it’s FREE! As usual when launching new initiatives, I wasn’t certain of the NBN’s prospects. But we had hundreds of enrollments within weeks and new bloggers joining our network every single week from our inauguration until just recently. The Nature Blog Network was, at its heart, a community meant to promote this very personal, very beautiful commitment so many of us have made to sharing our experiences of the natural world. It takes a community to drive a community, which is why we’re fortunate that folks like Nate Swick, Jane Blumenthal, John Riutta, Seabrooke Leckie, Rosie Nixon, Nicole Burgoz, and our dear departed friend April Lorier volunteered their time and passion to make this one blossom. But the title of this message probably confirms what you may have suspected if you’ve been keeping up with the Nature Blog Network. The bad guys have won. Our decrepit toplist software, which just didn’t keep up with the times, couldn’t hold up under the assault of literally thousands of spam registrations. At first we couldn’t approve new members. Now we can’t even log in. Worst of all, the toplist isn’t showing up. The damage is, as far as I can tell, irreparable. I was always excited when Mike sent me a new batch of blogs to be given a warm welcome through the NBN blog. NBN was such a great place to find niche blogs that I’d never have found through any search engine …easily! There were so many specialists in their own field of work sharing their stories and their images from across the world. It was far better than subscribing to a nature magazine as I was able to get to know the writer ‘behind’ many of the blogs and I formed some good friendships thanks to NBN. Based on the feedback so many of you have shared over the years, the Nature Blog Network has fostered countless connections involving well over 3,000 nature blogs. And just about every one of these blogs is worth reading… believe me, I’ve visited most of them! In some ways, this is the passing of an era, but, in Jane’s words, communities don’t end because one platform ends. Not just birders, but also herpetologists, marine biologists, mothing enthusiasts, writers, conservationists, artists, bloggers, and myriad other specialists, observers, and supporters who fall into the broad community we might call the network of nature lovers will continue to connect and work together to make our world a little better by protecting, fostering, and sharing nature at its best. TL; DR, the Nature Blog Network has run its course. Thank you to every one of you who joined our ranks or enjoyed what our international community cared so much about sharing. The community, which is the only part that really mattered, lives on. I, for one, cannot wait to see what comes next! I’m sad to see the end of the Nature Blog Network, just as I was sad to see the end of I and the Bird. But to tell the truth, I hadn’t paid much attention to it recently. The good news is that there are still many vibrant and interesting nature blogs even if many of the bloggers have changed since the early days. Thanks for all the hard work you did for us over the years. Happy Future, whatever you decide to do next. So, so sad. I loved Nature Blog Network. It was my go-to site when I was looking for something interesting to read , , , and I watched my stats daily. Thank you so much for welcoming me into the NBN fold. I met some fellow botanical artists through the network and now have some great friends. Deeply saddened to hear of the end of the site, but thanks you for all your hard work and dedication on behalf of us bloggers.. Although I never expect to be one of the Big League bloggers, just getting the feedback provided because of your efforts motivated me to strive for excellence. Thank you! Thank you so much for filling us in. I was starting to Google “what happened to Nature Blog Networks” just to see if there was some news. I had my low ranking blog in there, which was great, but more than that, it was such fun to browse through the various topics and find interesting stuff all over the world. Thank you for the NBN concept, the time invested, and the effort from the team in making it real.